Packed itinerary was an understatement. As part of their first joint tour as a royal couple, expectant parents Meghan Markle and Prince Harry maintained an incredibly busy 16-day schedule with nonstop appearances through Australia, Fiji, Tonga, and New Zealand. 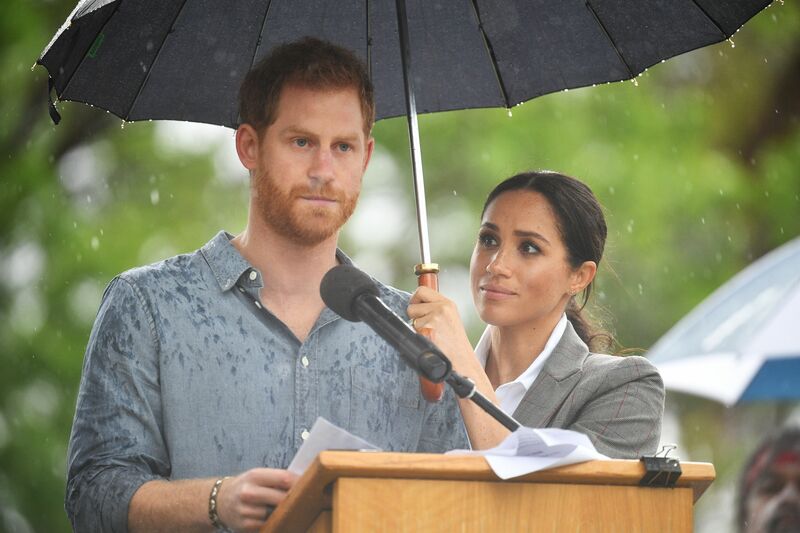 During their two-week trip, the couple managed to charm the world with numerous adorably affectionate moments, like that time when Markle thoughtfully held an umbrella for her husband while he delivered a speech. In another moment, Prince Harry reacted hilariously when a fan offered his wife a larger-than-life bouquet. 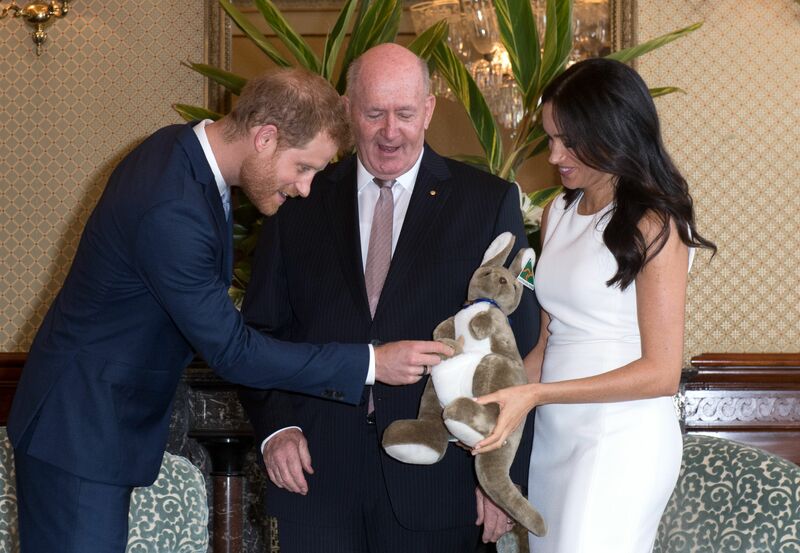 The Knot rounds up the cutest couple moments from the royal tour down under. The couple started their tour with a hand hold as they arrived to the Admiralty House in Sydney on October 16. Upon their arrival in Australia, the couple was greeted by Governor-General Peter Cosgrove, and his wife, from whom they received welcome gifts, including the traditional Akubra hats native to the region. One particularly adorable snapshot from the visit was of the couple receiving a plush stuffed kangaroo from Cosgrove. 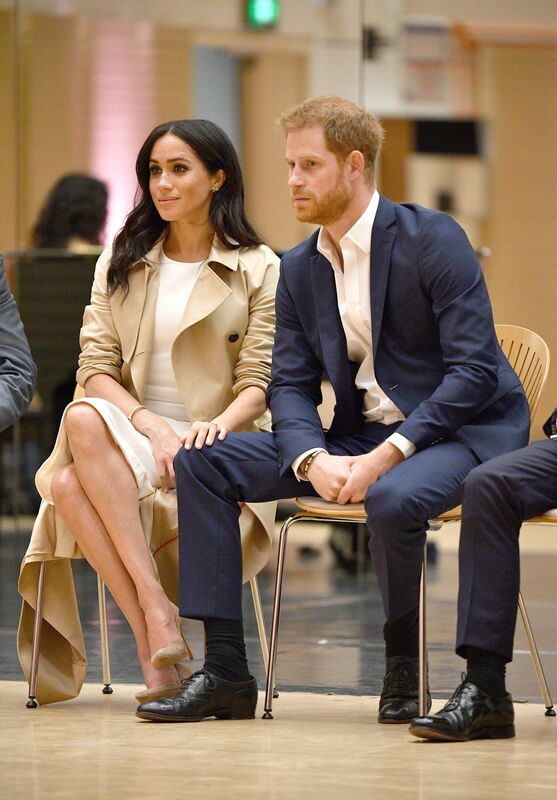 Markle was dressed in a sleeveless, brilliant white sheath dress paired with a trench coat while Prince Harry looked dapper in a tailored navy suit. The couple’s PDA, which is quite common despite royal protocol, was again and adorably on full display as they greeted fans and followers. 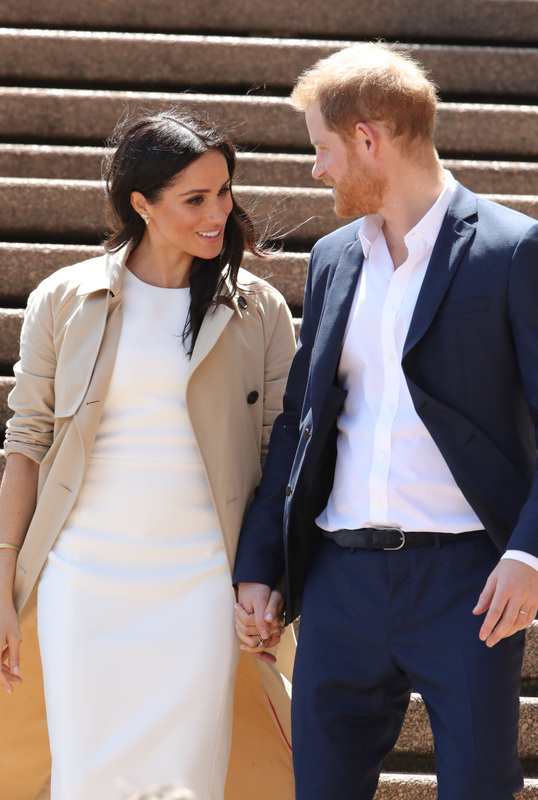 The couple stopped by the Taronga Zoo on the 16th of October for a scheduled appearance with young students and park creatures like koalas and yellow-bellied gliders. Markle received a beautiful bouquet from a child as she and her husband both dropped down to greet the kids from an eye-level perspective. After the zoo visit, the couple made their way over to watch an Aboriginal and Torres Straight Islander dance organization known as Bangarra Dance to witness a special performance. 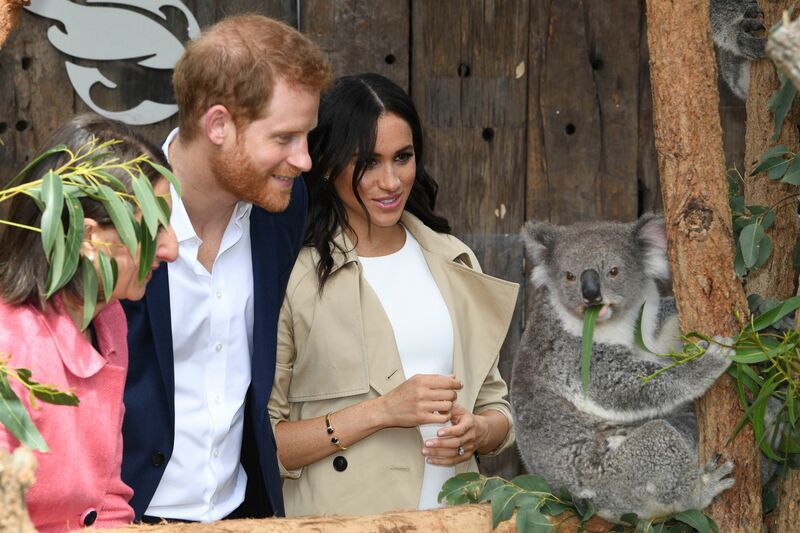 Britain’s Prince Harry and Meghan Duchess of Sussex, meet Ruby a mother Koala who gave birth to koala joey Meghan, named after Her Royal Highness, with a second joey named Harry after His Royal Highness during a visit to Taronga Zoo in Sydney, Australia, Tuesday, Oct. 16, 2018. Prince Harry and his wife Meghan are on a 16-day tour of Australia and the South Pacific. Meghan Duchess of Sussex and Prince Harry at the Bangarra Dance Company viewing a rehearsal at the Sydney Opera House of Spirit 2018 by the Bangarra Dance Theatre, an internationally acclaimed Aboriginal and Torres Strait Islander modern dance company. The pair completed their visit on October 16 with a stop by the Sydney Opera House where they met fans and spectators and enjoyed a walk along the Western Boardwalk. 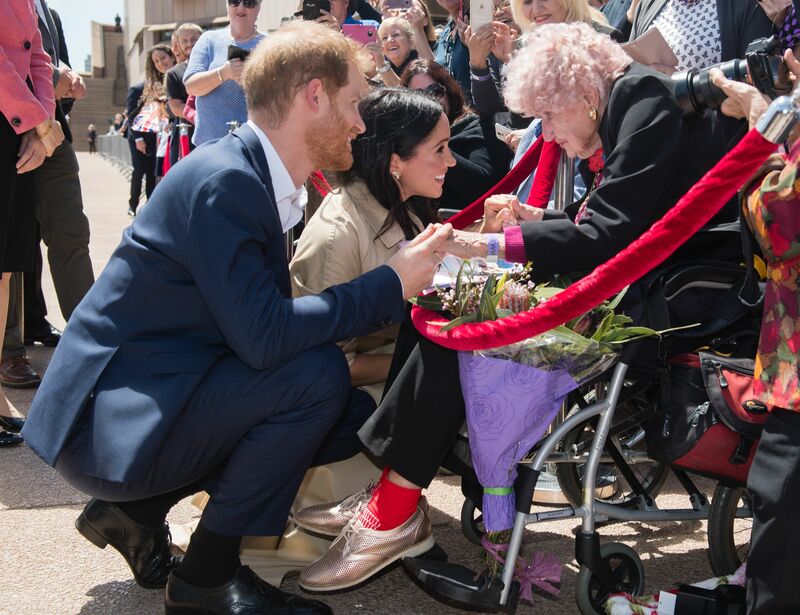 It was during that particular portion of their site visit that Prince Harry greeted an especially devoted follower named Daphne Dunne, age 98, who previously met the royal in 2015 and in 2017. 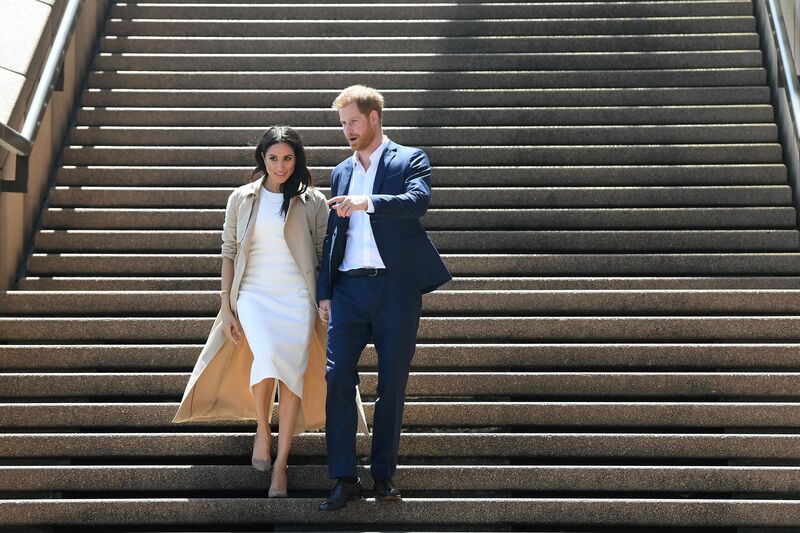 While enjoying a stroll through Sydney, the Duke and the Duchess resolutely held hands as they descended down a set of stairs. For that particular appearance, Markle chose a pair of delicate butterfly earrings that belonged to the late Princess Diana. Britain’s Prince Harry and his wife Meghan, the Duchess of Sussex, hold hands as they walk inside after posing for a photograph with Australia’s Governor General Sir Peter Cosgrove and Lady Cosgrove and representatives of the participating countries of the Invictus Games during a welcome event at Admiralty House in Sydney, Australia, 16 October 2018. The Duke and Duchess of Sussex are on a 3-week tour of Australia, New Zealand, Tonga, and Fiji and are in Sydney to launch the 2018 Invictus Games, an Olympic-style event for disabled and ill service people. As the couple arrived in Australia, they announced that the Duchess of Sussex is pregnant and they are expecting a child next spring. 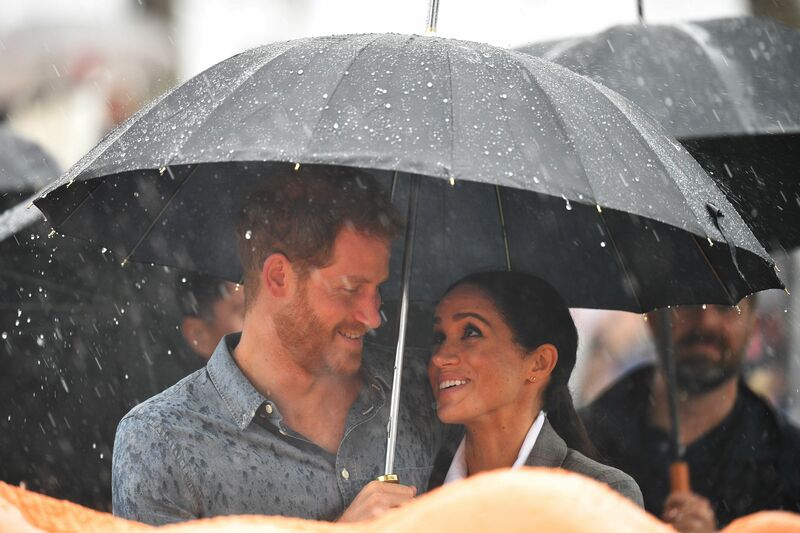 The couple shared yet another sweet moment during a rainy afternoon in Dubbo, Australia, on October 17. While visiting Victoria Park for a community celebration BBQ picnic, rain foiled much of the scheduled activities planned for that day. 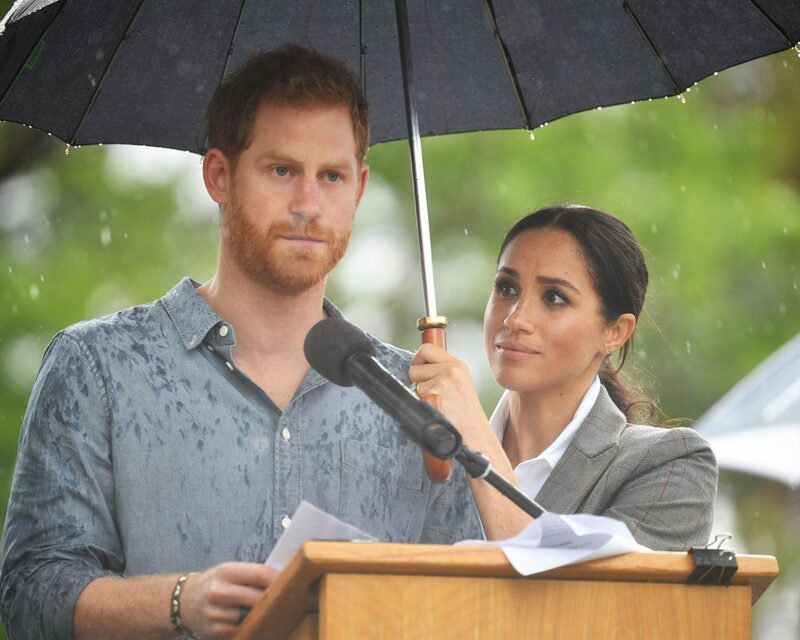 However, Harry still delivered a speech in the rain–and Markle followed him up to the stage to shield him with her umbrella. Markle and Harry stopped by Melbourne for an official engagement on October 18, where the couple was spotted by an eagle-eyed fan with a double hand hold. While already holding hands, Prince Harry then pulled his other hand around his back to gently clasp Markle’s hand. In preparation of the Invictus Games Opening Ceremony on October 20, Prince Harry took to the stage to practice his speech inside the Sydney Opera House… for an audience of one. Kensington Palace posted a behind-the-scenes snapshot of Markle watching her husband from the front row earlier that day. The couple watched teams compete from sea on October 21, both coordinating outfits in more casual attire with Markle in sneakers and her husband in slacks. One especially eager fan joined the Duke and the Duchess of Sussex on their boat and even delivered a big embrace to Prince Harry. “Now that’s a hug!” Markle laughed. The pair attended an official state dinner hosted by the President of Fiji with Markle clad in brilliant blue caped gown and her husband in a sleek tuxedo. 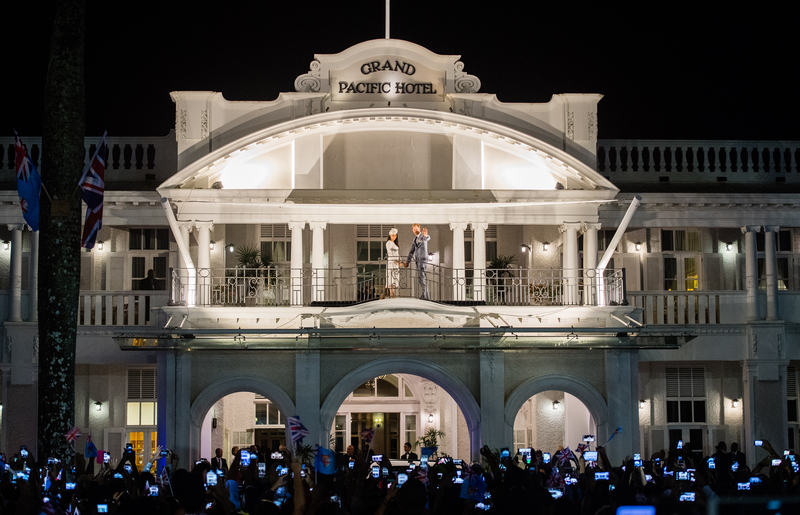 During a visit to the Grand Pacific Hotel in Suva, Fiji, the Duke and the Duchess greeted the public assembled around Albert Park from the central balcony of the property on October 23. 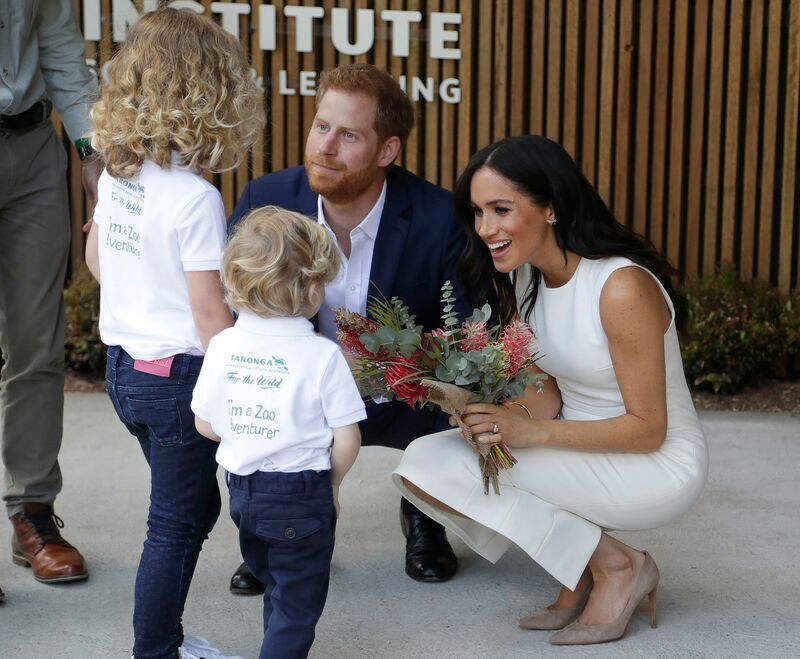 An unofficial royals account on social media revealed a rather adorable moment when a devoted fan chased down the Duke and the Duchess of Sussex with a massive size bouquet on their first day in Australia. Upon receipt, Markle thanked the fan from the crowd while her husband joked: “You can’t give flowers that big to my wife. What’s that all about?” Watch the sweet moment below. A State Dinner… Or a Wedding? Markle wore a wedding worthy gown by Theia during an audience with King Tupou VI and Queen Nanasipau’u at the Consular House in Nuku’alofa. 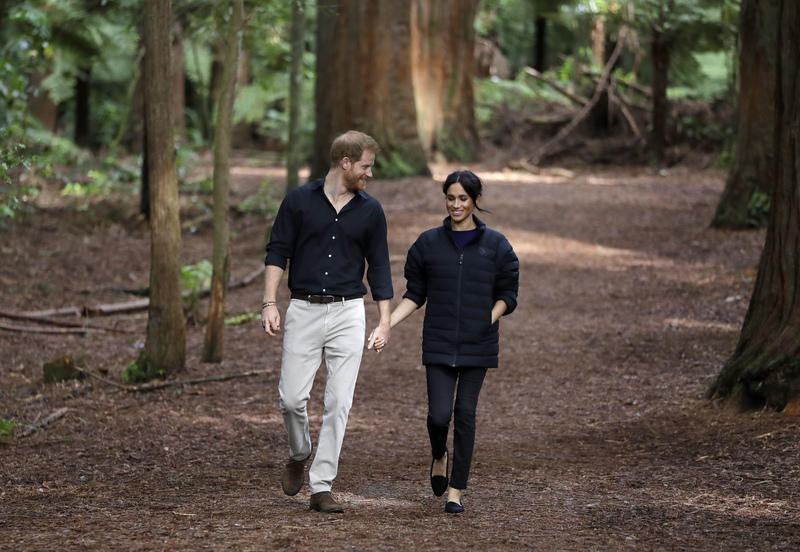 The beautiful pair ended their tour by holding hands in Rotorua, New Zealand, during a breathtaking walk through the Redwoods. This was the couple’s first joint tour following their May 19 wedding. The palace announced the pregnancy on the first day of the tour, after the couple attended Princess Eugenie’s wedding on Friday, October 12. Kensington Palace announced they will welcome their first child together sometime next spring. Follow along with The Knot as we cover more sweet moments from the couple’s tour. 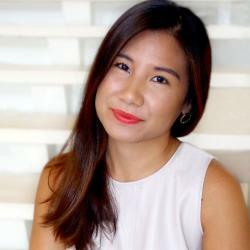 Secure your ideal wedding vision by starting with The Knot’s Style Quiz, here. Be the first to comment on "Meghan Markle and Prince Harry’s Cutest Official Joint Tour Moments"